I started out very focused on the story missions, especially in the starting area of White Orchard. Unfortunately you cannot return here until you have finished the game, so I ended up skipping a lot of content. In particular, I was very wary of Gwent, having sunk way too many hours with the awful dice poker minigame in the Witcher 1 & 2. 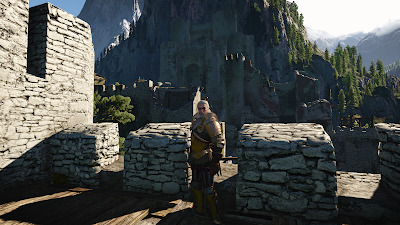 My first visit to Skellige was also very brief. It was only once I had returned to Caer Morhen and commenced the quest "Brothers in Arms" that I really began to take my time to savour the game and indulge in side quests. I regret that I never got to play gwent with the Bloody Baron, but I very much enjoyed all of the interaction with Dandelion, Letho and Dijkstra. I found the Whispering Hillock quest very odd, especially in the context of what you later discover about the "ladies" of the wood, but I'm glad that Phillip Strengar and his wife had a happy(ish) ending. After allowing Roche to kill Henselt in the Witcher 2, I could hardly fault Letho for assassinating Foltest and Demavend at the behest of Emperor Emhyr var Emreis. Hence, he is still alive and makes an appearance in the Witcher 3, as mentioned above. Roche and Ves aren't too happy about fighting alongside him at the battle of Caer Morhen, but they are professional enough to set aside their differences. In fact, I end up assisting Dijkstra, Roche and Philippa Eilhart in their plot to assassinate King Radovid V of Redania. Unfortunately Dijkstra betrayed us afterwards and I had to kill him and his men to prevent him from killing Roche and Ves. Although Dijkstra urged me to declare my love for Triss after smuggling the mages out of Novigrad, I couldn't bring myself to do it. The mages needed her to lead them to Kovir, how could I ask her to stay? Finding the wilted rose of remembrance in Triss' apartment was a very poignant moment. 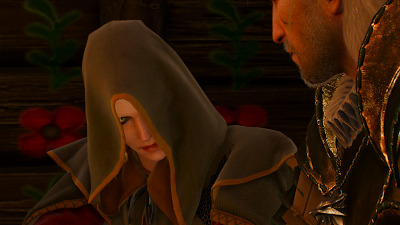 She was the primary love interest in Witcher 1 & 2, so it felt very odd for the third game to force Geralt and Yennefer to end up together like they do in the novels of Andrzej Sapkowski. On the other hand, I was very happy with the fate of Ciri at the end of the game. Even on a second play through, I doubt I would choose either of the alternative endings for her. I don't feel that I should say any more than that. I've been playing Baldur's Gate II: Enhanced Edition on my Nexus 7 tablet, which is the 3rd time that I've restarted this game from scratch. I didn't have my save game from 2013 when I played BG:EE, since I had to wipe my laptop and the backup is in Australia. I also made a few screwups with my game in the early stage, which I've managed to fix using EE Keeper to edit the save files. You'll see lots of mentions of CLUA Console on the forums, but it's tricky/impossible to get this working in the Android version of the game, even if you use a bluetooth keyboard. After watching Blade Runner 2049, I was in the mood for some more neo-noir, so I decided to give Martian Memorandum another go. This is the second in the Tex Murphy series of point-and-click adventure games, originally released in 1991. It is one of many old school games that have been revived by GOG.com and can be played on modern computers. I was even able to play it on my Mac, using Boxer/DOS Box! My review (with some minor spoilers) is below.